NEW: Dem strategist defends czars, says they're "people with special expertise"
WASHINGTON (CNN) -- As one so-called White House czar resigned over the weekend, President Obama announced the appointment of another one Monday, much to the frustration of Republican critics. 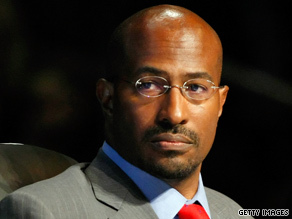 Van Jones resigned from his "green jobs czar" post amid criticism. By some accounts, Obama has nearly 30 czars, who are officially called special advisers. The czars cover issues from AIDS and health care to Middle East peace. Czars are nothing new. They date back to early presidents, including Franklin Roosevelt. Republicans also had czars: Richard Nixon had an energy czar, and George H.W. Bush appointed the first drug czar. "What you see with President Obama is this reliance on czars," GOP strategist Kevin Madden said. "And I think there are probably even some corridors of power within the administration that probably didn't like the idea that you have czars that are encroaching on their policy portfolios." David Gergen, a CNN contributor and former aide to past presidents, said the czar controversy has given Republicans an opening to question the administration's decisions. "Now with President Obama, we have a number of people who answer to the president but not to Congress," he said. "When the Congress looks at it and sees over 30 people with czar titles, it naturally begins to worry that a lot of authority has been taken away and stripped of the Cabinet." The main issue, Gergen said, is that there are "about 25 too many" czars in the current White House. Sen. Lamar Alexander, R-Tennessee, said that number is an "affront to the Constitution." "We have about two dozen so-called czars -- the 'pay czar,' the 'car czar,' all these czars in the White House," said Alexander, who is the Senate Republican Conference chairman. But Alexander said the lack of oversight is adding "fuel to the fire by those who think Washington is taking over everything." Democratic strategist Maria Cardona said the number of czars is not the issue, because "this is something that happens in all administrations." Donna Brazile, a CNN contributor and Democratic strategist, defended the Obama administration's use of the special advisers. "President Obama is assembling the best and the brightest to help transform our economy to ensure that we can adapt to the new conditions that face us each and every day," she said. "These are people with special expertise." Indiana Rep. Mike Pence, chairman of the House Republican Conference, said Sunday that Obama should suspend any future czar position as Congress "carefully examines the background and qualifications of the more than 30 individuals who've been appointed to these czar positions." On Monday, Obama appointed Ron Bloom to be special adviser for manufacturing policy, or the "auto czar." "Ron has the knowledge and experience necessary to lead the way in creating the good-paying manufacturing jobs of the future," Obama said in a statement Sunday. "We must do more to harness the power of American ingenuity and productivity so that we can put people back to work and unleash our full economic potential." Republicans have grumbled about the appointments since the beginning of his administration, but revelations about the past of Obama's green jobs czar, Van Jones, caused the grumbling to grow louder. Jones resigned early Saturday after an onslaught of criticism aimed at his past statements and affiliations. In 2004, Jones signed a petition that called for an investigation of whether government officials allowed the 9/11 terrorist attacks. In a statement last week, Jones said of the petition on the Web site 911truth.org: "I do not agree with this statement and it certainly does not reflect my views now or ever." As to whether the president ordered the resignation, White House adviser David Axelrod said "absolutely not. This was Van Jones' own decision." White House Press Secretary Robert Gibbs said that Obama accepted Jones' resignation because "the agenda of this president was bigger than any one individual." "The president thanks Van Jones for his service in the first eight months, and helping to coordinate renewable energy jobs that are going to lay the foundation for our future economic growth," he said. Jones, in a statement, said he did not want to distract from the administration's agenda. "I cannot in good conscience ask my colleagues to expend precious time and energy defending or explaining my past," he said. CNN's Mary Snow contributed to this story.